Yesterday, I had a lunch meeting about Bailout Nation with the folks at Borders HQ in Detroit was quite interesting. I was over-caffeinated, and essentially babbled away for 2 hours. I did manage to remember to ask a few questions, and learned quite a bit. It was an education for me in a real “Art meets Commerce” kind of way. There is the creation of content, and then there is the selling of that content. They are two utterly different worlds, bound by a small overlap. (Picture a 2 circle Venn Diagram, with a rather smallish “c”). Quite fascinating to me, as I know little of the publishing/book selling universe, especially in the midst of a severe recession. 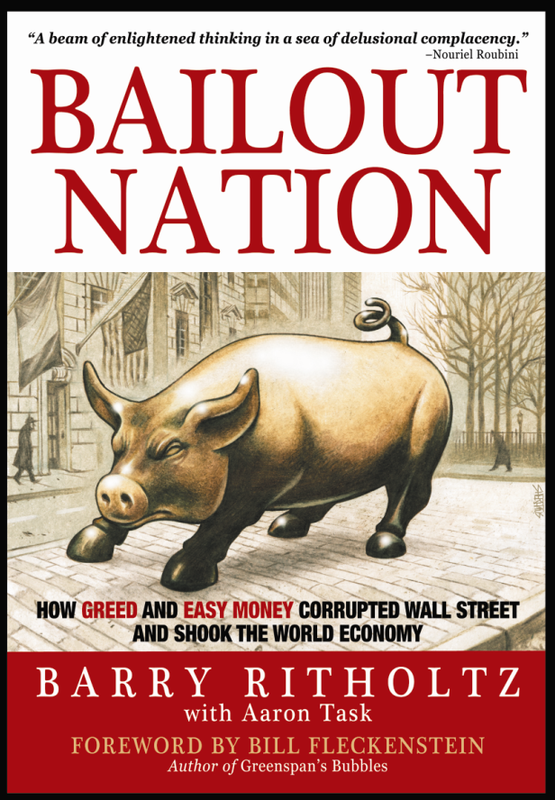 We discussed the book, purchase promotions, driving traffic to stores and websites, the Bailout Nation blog (coming soon! ), and a bunch of other related things. They asked me what shows I wanted to do to promote the book, and I gave them the full run down. What really surprised me was their reactions to two of the quasi-news opinion programs — The Daily Show with Jon Stewart, and The Glen Beck Program. After Oprah, these two are (apparently) amongst the biggest book sellers on TV. Like Oprah, Glenn Beck has a loyal audience, is perceived as very sincere — and moves books. But the most intriguing “inside baseball” stuff we discussed was the impact of The Daily Show on book sales — in particular, two recent books that were the subject of big TDS segments. These were mentioned as prime examples of the power of Jon Stewart. The first is House of Cards: A Tale of Hubris and Wretched Excess on Wall Street by William D. Cohan. After Stewart raved about the book (“Helluva book — you made finance read like a suspense novel”) when Cohan was on the show April 9th, sales of the book in stores tripled. They have been strong ever since. The second example was the infamous James Cramer appearance on TDS on March12th. According to the people I had lunch with yesterday, the very next day, sales of Cramer’s book Jim Cramer’s Real Money: Sane Investing in an Insane World went into free fall. They absolutely plummeted — and they haven’t recovered since. And that’s the power of TDS . . .
Should Washington & Wall Street Take a Lesson from Bill Ford?